A Self-Directed IRA LLC is a type of IRA that allows the IRA holder (you) to gain control over your retirement funds so you have the ability to self-direct the type investments that you want to make using your retirement funds. With a traditional Self-Directed IRA, you as the IRA holder must direct the IRA custodian to make the investment you wish to make using your retirement funds, which often triggers high custodian fees and transaction delays. Whereas, with a Self-Directed IRA LLC with Checkbook Control you as the IRA LLC manager will have the ability to make traditional investments (stocks, mutual funds) as well as non-traditional investments (real estate, precious metals, etc) tax-free and without custodian consent. 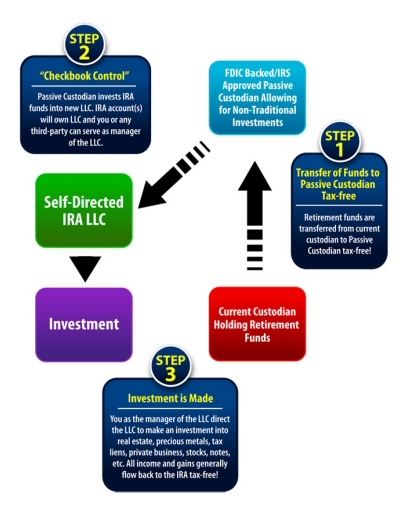 The Self-Directed IRA LLC “Checkbook Control” Structure is IRS and tax court approved. The idea of using an entity owned by an IRA to make investments was first reviewed by the Tax Court in Swanson V. Commissioner 106 T.C. 76 (1996). In Swanson, the Tax Court, in holding against the IRS, ruled that the capitalization of a new entity by an IRA for making IRA related investments was a permitted transaction and not prohibited pursuant to Code Section 4975. The Swanson Case was later affirmed by the IRS in Field Service Advice Memorandum (FSA) 200128011. Unlike a conventional Self-Directed IRA which requires custodian consent and requires high custodian fees, a Self-Directed IRA LLC with Checkbook Control will allow you to buy real estate or make other investments by simply writing a check. With a Self-Directed IRA LLC, a special purpose limited liability company (“LLC”) is established that is owned by the IRA (care of the IRA custodian) and managed by you or any third-party. As manager of the IRA LLC, the IRA holder (you) will have total control over the IRA assets to make the investments you want and understand – not just investments forced upon you by Wall Street. With IRA Financial Group’s Self-Directed IRA LLC, you will have total control to make any approved investment, including a real estate purchase, pay for improvements, and then sell the property without ever talking to the IRA custodian. Since all your IRA funds will be held at a local bank in the name of the Self-Directed IRA LLC, all you would need to do to engage in a real estate transaction or other investment is write a check straight from the IRA LLC account or simply wire the funds from the IRA LLC bank account. No longer would you need to ask the IRA custodian for permission or have the IRA custodian sign the real estate transaction documents. Instead, with a Checkbook Control IRA, as manager of the IRA LLC, you will be able to execute the IRA investment by simply writing a check. With a Self-Directed IRA LLC you will never have to seek the consent of a custodian to make an investment or be subject to excessive custodian account fees based on account value and per transaction. By having a Self-Directed IRA LLC, you will gain checkbook control over your IRA funds so you can make real estate and other investments tax-free and without custodian consent. “Checkbook Control ”: With a Self-Directed IRA LLC with Checkbook Control, as the IRA LLC manager (the IRA care of the custodian will be the owner/member of the LLC), you will no longer have to get each investment approved by the custodian of your account. Instead, as manager of the Self-Directed IRA LLC, all decisions are truly yours. To make an investment, simply right a check and use the funds straight from your Self-Directed IRA LLC bank account. Invest in Real Estate & much more Tax-Free: With a Self-Directed IRA LLC with checkbook control, you will be able to invest in almost any type of investment opportunity that you discover, including: real estate; your only limit is your imagination. The income and gains from these investments will flow back into your IRA tax-free. Reduce Custodian Fees: With a Self-Directed IRA LLC structure, you will be in a position to save a significant amount of money on custodian fees. With a Self-Directed IRA LLC you no longer have to pay excessive custodian fees based on account value and transaction fees. Instead, with a Self-Directed IRA LLC, you will have the power to act quickly on a potential investment opportunity. When you find an investment that you want to make with your IRA funds, as manager of the Self-Directed LLC, simply write a check or wire the funds straight from your Self-Directed IRA LLC bank account to make the investment. The Self-Directed IRA LLC allows you to eliminate the delays associated with an IRA custodian, enabling you to act quickly when the right investment opportunity presents itself. Tax Deferral: With the Self-Directed IRA LLC structure, all income and gains from IRA investments will generally flow back to your Self-Directed IRA LLC tax-free. Because an LLC is treated as a pass-through entity for federal income tax purposes and the IRA, as the member of the LLC, is a tax-exempt party pursuant to Internal Revenue Code Section 408, all income and gains of the LLC will generally flow-through to the IRA tax-free! Buy your retirement home or vacation property now at today’s prices, rent it out, and then move in at the age of 59 and 1/2! Generate tax-free income and shield your retirement assets from creditors or bankruptcy! The IRA Financial Group will take care of the entire setup of your Self-Directed IRA LLC “Checkbook Control” structure. The whole process can be handled by phone, email, fax, or mail and typically takes between 7-21 days to complete, the timing largely depending on the state of formation and the custodian holding your retirement funds. Our IRA experts and tax and ERISA professionals are on-site greatly reducing the setup time and cost. Most importantly, each client of the IRA Financial Group is assigned a retirement tax professional to help with the establishment of the Self-Directed IRA LLC “Checkbook Control” structure. You will find that our fee for this service is significantly less than other companies that perform the same or similar services. To learn more about the Self-Directed IRA LLC structure, contact one of our IRA Professionals at 800-IRA-0646 today!